There is an important shift happening in the job market. Organizations are faced with a huge burden to retrain workers, while professionals are seeking continuous development to remain relevant in an ever more competitive workforce. This drives a need for alternative, specialized credentials to showcase new skills and competencies, which can be quickly recognized by prospective employers. One possible solution can be found in the use of open-source digital badges, also known as Open Badges. In this post, we explain the basics about Open Badges and how they are being used at the IDB and beyond. What exactly are digital badges? Digital badges are visual digital representations to recognize skills and achievements acquired inside or outside the classroom. They are “a way to display talents ranging from the practical (proficiency in a computer program) to the academic (demonstrated competency in a subject area).” Corporations use digital badges to recognize competencies and achievements that are valuable to their business. 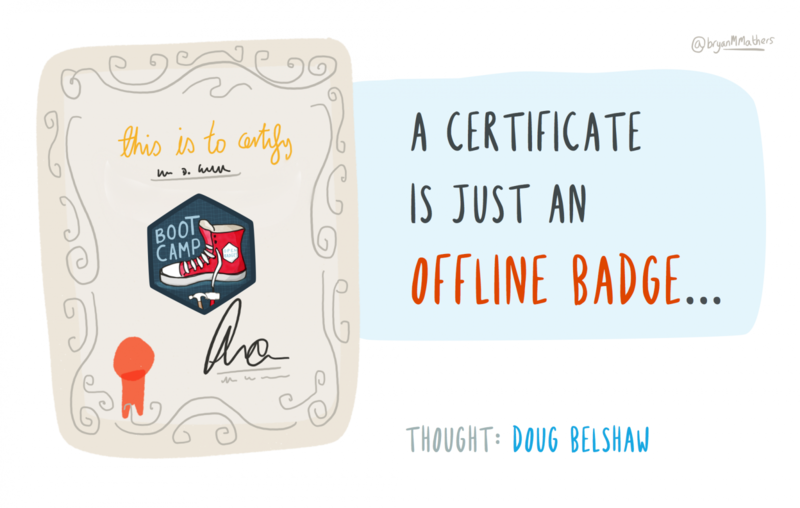 A certificate is just an offline badge. Digital badges are displayed as a digital symbol that can be posted on a website. Most importantly, they are linked back to the issuer of the badge, the assessment criteria and the evidence of achievement, which substantiates the badges’ credibility. Users will also easily be able to display their badges using different social media channels such as LinkedIn, Facebook and personal blogs. What are open digital badges? Open Badges are not controlled by any one organization. Instead they are free, open-source and accessible to the world-wide community. Open Badges are evidence-based. The information about who, why, and for what the badge was issued is hard-coded into it as metadata. Open Badges are stackable. Digital badges from different organizations can be built on top of each other, building a rich ecosystem. Open Badges are transferable. Badges earned in one environment can be shared in another. Open Badges put the user in control. Badges are private until they are published by the user. In 2011, Mozilla started a new project called “Open Badges”, which aimed at making use of digital badges at a global and decentralized scale. It was open-source and therefore the software was free and its technical specifications were open. The open nature of the specification makes it easy for anyone to issue, earn, and display badges across the web—through an infrastructure that uses shared and open technical standards. Moreover, it allows for various parties to develop software that will easily interact with such badges over the web, be it for issuing, earning them, displaying them or making endorsements. Since its inception, the open-badge initiative has grown through a large community of contributors, which include NASA, the Smithsonian and Intel. Today, Open Badges are an emergent technology and continue to be developed aiming at expanding its market development and adoption. In 2017, IMS Global Learning Consortium took over the management of the evolution of the Open Badges Specification, through an open-governance, member-based standards consortium model. The Open Badges Specification continues to evolve and includes recent developments meant to improve transparency, increased data portability, support version control, and the possibility to issue badges in multiple languages. Given the importance of the open standards that characterizes Open Badges, throughout the rest of this post, open digital badges are referred often as simply digital badges or badges interchangeably. What are the advantages of using Open Badges? Open Badges establish a common framework for recognizing skills and competencies between employers, professionals and educational providers. When accepted and used by all parties, open badges become a major channel of communication, establishing common standards and common language that define and describe professional achievement. For organizations, open badges help identify quality professionals through recognized and substantiated skills and competencies. For individuals, open badges are a way to display such skills and competencies, making them more visible in the job market. How do these digital badges work? There are four major players in a badging ecosystem: earners, issuers, displayers and acceptors. The basic workflow describing how these players interact in the process of earning, issuing, claiming, sharing and recognizing a digital badge, can be described by the diagram below. Earners are those who earn the badges. Earners will be able to claim digital badges for having achieved or completed the requirements stated as part of the digital badge criteria. Earners collect digital badges from various issuers. Issuers are the organizations who award the badges according to assessment standards. Various providers serve as digital badge issuers, for example universities, professional organizations and various training and re-training programs. Digital badges are also issued by corporations, can be used for internal promotions, for recognition of individuals with stellar performance, and support professional growth. Issuers will use digital badge software through which earners of badges can claim their digital badges. Displayers are the web-based platforms that display the digital badges on behalf of the earners. Earners can share their badges through various platforms, such as LinkedIn, Facebook, Twitter, and personal ePortfolios. The sharing of such badges creates the fertile environment for demonstrating skills and knowledge through clear evidence and recognized corroboration, which potentially opens doors for partnerships, new jobs, new educational opportunities, etc. Finally, the Acceptors are individuals and organizations who accept the badge as a proof or evidence of the achievement of that competency and /or skill. There are various companies seeking to help issuers meet the technical needs for offering digital badges, mostly through a Software-as-a-Service model. These so-called “digital badge platforms” include companies such as Badgr.io, Credly, Badge Alliance, Accredible, Open Badge Factory, and others. These services work to integrate new features consistent with the Open Badge specification. Who is using Open Badges? The Open Badges website offers a long list of those using badges: organizations which are issuing badges and those designing badges. The list includes several educational institutions, such as University of Southern California, University of Illinois and UC Davis; as well as other organizations such as Disney-Pixar, Gogo Labs, and Microsoft. An interesting example is Smithsonian Quests. This is a program that “connects and rewards learners of different regions as they learn through discovery and collaboration”. Students do online activities and receive incentives to continue through badges, which in many cases are “integrated with content from online education conferences”. The quests are aligned with school curriculum and are grade appropriate. Educators can also earn badges resulting from their participation in online conferences. Another example is the project Whitecard, which develops simulation, training and educational software. Through agreements with NASA and the Mozilla Open Badge Infrastructure Project Whitecard has created the Starlite Digital Badges system that support the showcasing of scientific achievement. What is the role of open digital badges at the IDB? The IDB has become an important player in providing eLearning opportunities for professional capacity building in various thematic areas of development in Latin America and the Caribbean (LAC). The IDB is stepping into the digital badge arena with two major intertwined goals. First, to become a recognized issuer of digital badges for those successfully completing courses delivered through IDB. Second, to become a change agent in the credentialing landscape by supporting and endorsing innovative and effective ways to recognize professional achievement of professionals in topics associated to development in the LAC region. Does your organization use Open Badges? Share your experience including a comment below! This post is an update to the original article published March 17, 2015.